Many of our clients ask how we go about enlisting new registrants for our web site. 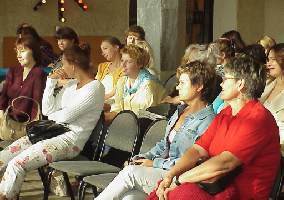 One of the ways, and for the 5th consecutive year, is to hold a public presentation that Togliatti ladies can attend to introduce them to the world of foreign correspondence, and to understand what our company does and how we do it! 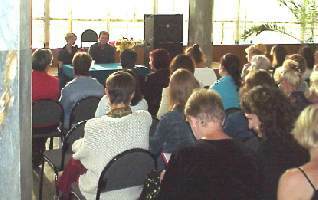 On Thursday, August 24, A Volga Girl sponsored one of many public presentations held over the past 5 years. 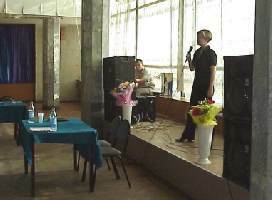 Russian Office Manager Helen Bessonova directed this informative event. While many of the ladies in attendance had heard of our company either through friends or family ... on this day they took advantage of the opportunity to see and hear firsthand what foreign correspondence is all about. 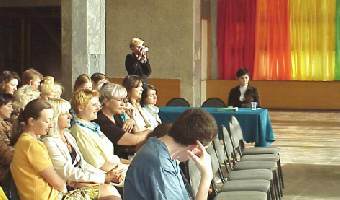 A Volga Girl's Ludmila Semukhina is seen (upper left) filming the entire event. 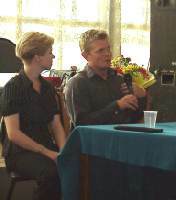 Explaining the company history, which began in August 1999, and in particular the circumstances surrounding the marriage of company founders Craig & Arina Rich, those ladies in attendance listen with great curiosity and interest. 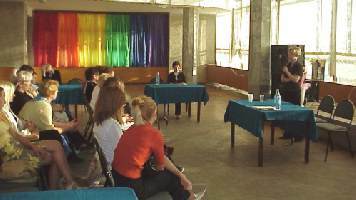 The attendance of foreign (male) visitors is always a point of interest during our company presentations. In the photos above we see Ben (from California and visiting a number of ladies with whom he has been in written correspondence) answering questions. 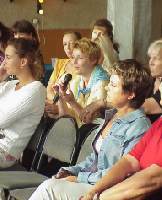 Audience participation is always a large part of A Volga Girl's presentations. A Volga Girl's Men's Catalog is always brought to all company presentations and circulated throughout the audience. Our Men's Catalog is a great way to atract attention to yourself through inquiries that the ladies make about corresponding with you!